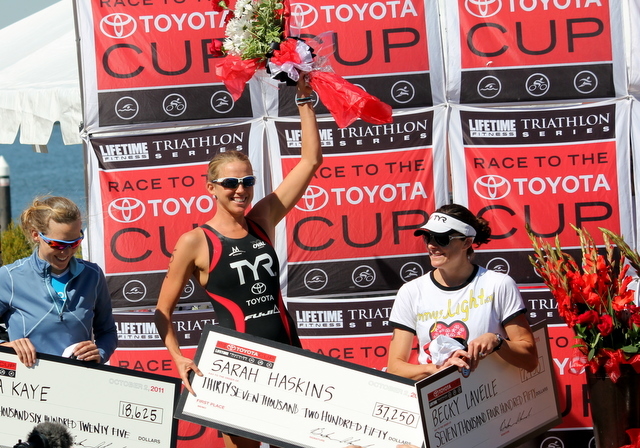 The finale of the Race to the Toyota Cup was completed yesterday in beautiful Rockwall, Texas. This race was the seventh race in the series and this my fifth race completed in the series. The top five scores in the series go towards each athlete’s overall score. I finished the series with wins in South Beach, Austin, Minneapolis, and Chicago and a second place in Rockwall TX. I am pleased to accomplish my season long goal and defend my title from 2009. Not to mention, winning a Toyota Prius, that usually only happens on the Price is Right! Race morning was very easy in preparations, since transition was in the front parking lot of the Hilton Hotel and swim start was in the backyard! I woke up at 5:05AM, ate my normal breakfast of natural peanut butter, honey, and banana on a bagel thin. I also drank ½ strength of lemon lime EFS electrolyte drink. I went down to the parking lot to set up my transition area and not expecting the cold temps!! It was a brisk 55 degrees outside and I was looking forward to getting back to the hotel to warm-up before my warm-up. 50 minutes before race start, I did a 15 min run mixed with drills and strides. It was still dark outside, so I was careful not to venture too far down a dark street. I was not able to get a swim warm-up in, so I was not sure how I would feel, but sometimes you just go with the flow. The race started at 7:24 AM (four minutes behind the men) with a deep water start (well, not so deep since Texas is in a severe draught). Last year, the athletes started with a dive, but since the water was four feet deep, it was declared not safe for a dive start. I felt a bit cold in the swim and not as great as normal, possibly due to lack of warm-up. However, I was still pleased with my swim, exiting second about 25 seconds behind Sara McLarty my TYR Saynoara really help me stay close. The bike started off a steep climb out of transition, but that was just a peak of what was to come. The course was more challenging than I had expected with most of the ride feeling like an uphill climb into the wind! I was a bit chilly at the start of the ride and early on the ride, my legs had the deep ache! About 2 miles into the ride, I passed Sara, but about 7 miles into the ride, Lisa Norden flew past me. I did not have it in me yesterday to try and match her speed. I wanted to at least maintain my position in second coming off the bike. About 17 miles into the bike, I was really starting to feel the burn and was looking forward to getting off and running. I drank 20 ounces of EFS while on the bike, slightly less than normal due to the cooler conditions. I headed out of T2 in second place, again up a long climb. I have to say I felt the best on the run yesterday and was able to hold my position. I did not make up any ground and did not lose any ground. The race win was not in my reach, but I knew I could earn the overall series win. 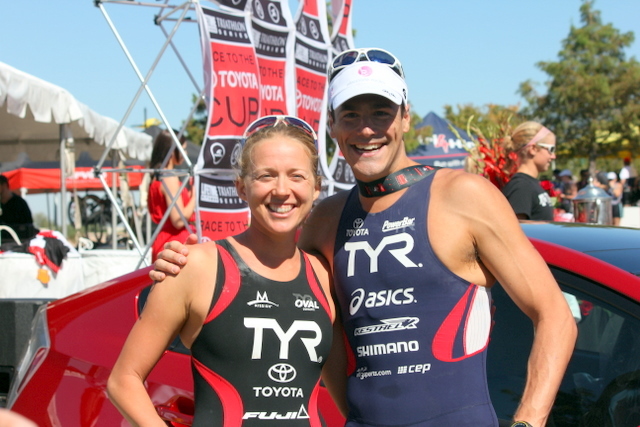 A big congratulations to Andy Potts for taking the overall series win on the men’s side! I had a blast racing the Race To The Toyota Cup Series this year and excited to return next year to defend the 2011 Title. It was great to see so many pro women out on the starting line and a big congrats to Alicia Kaye and Becky Lavelle for taking second and third in the series. My season is not yet over, but getting close to the finish line. 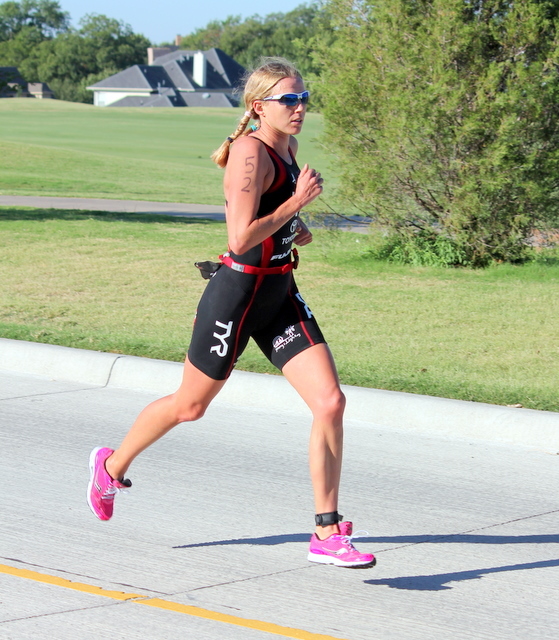 I will be staying in Dallas this week, before heading over to Huatulco,Mexico for an ITU World Cup. I will be mentally preparing for heat, humidity and a 20% climb that I have to do 8 times! Thank you to all my friends, family and sponsors who helped me throughout this journey.